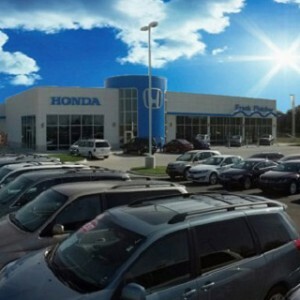 Mid-Missouri Honda wants to share the good news with you. If you’re in the market for a new vehicle that unites a sublime engine, superb transmission, and divinely inspired driver-assist features with the latest and greatest in safety specs, exterior frills, and technological sophistication, then the CR-V is pleased to grace your presence. In addition to providing unparalleled performance, safety, and design features, the CR-V is also outfitted with the very best in interior design, with a host of exciting new amenities and an abundance of space in the cabin for you and your passengers to sit back, stretch out, and enjoy the ride. 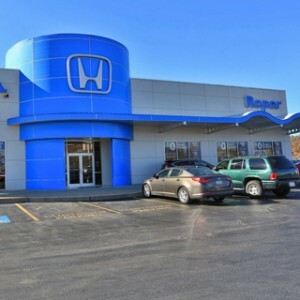 Read on for all the details, and then come down to a Mid-Missouri Honda Dealers location to see it for yourself! 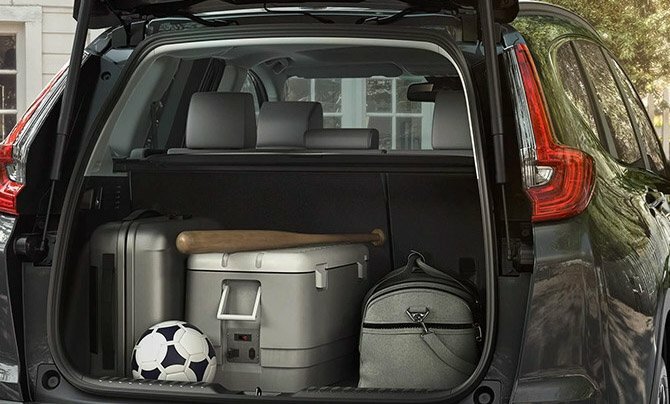 With seating for five passengers and between 101 and 105 cubic feet of passenger space, the CR-V promises you and your whole family ample comfort on your next drive across the state. Meanwhile, the CR-V will also give you four-way lumbar support as well as 12-way power-adjustable seats, allowing drivers and passengers to enjoy the very finest in comfort throughout the drive. The CR-V also features a beautiful interior design, with the very best in leather seating material. But not only will you get leather-lined seats, you can also expect a leather-wrapped steering wheel and a shift knob, rendering the CR-V stunningly beautiful inside. And when winter comes—as come it must—you’ll be prepared, because the CR-V also gives you heated seats to allow you and everybody onboard to stay warm. The CR-V also features a 7-inch Display Audio touchscreen that makes enjoying the crispest, clearest audio as simple as swiping your finger across a screen. Not only will you be able to construct playlists, make song selections, and turn up the volume with the most basic operations, but you can get a plethora of musical choices with the CR-V’s Bluetooth compatibility. 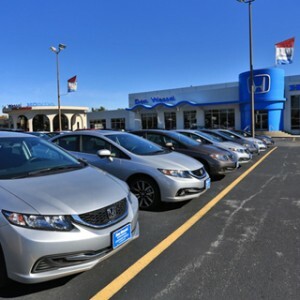 Likewise, the Honda Satellite-Linked Navigation System gives you and your passengers reliable access to route information, data about destinations, and all the information you could hope for related to your journey. With HondaLink Next Generation, you can stay connected to family and friends throughout the drive, making it possible for you to connect your smartphone to your CR-V’s console and giving you access to all your own maps, apps, music, and more. 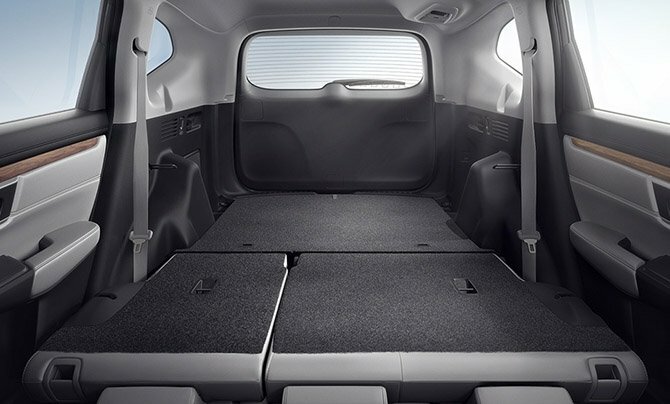 Cargo Space – The CR-V also offers generous room for cargo, with 37.2 cubic feet with the rear seats up and 70.9 cubic feet with the rear seats down. What’s more, the CR-V also provides you with an adjustable parcel shelf which makes it easy to stow away everything from a tablet to a bag to a drink. Versatility – The Honda CR-V comes with easy fold-down 60/40-split rear seats, which allow your family to choose how to apportion the car’s space, depending on the number of passengers, the amount of luggage, and the necessities of your drive. 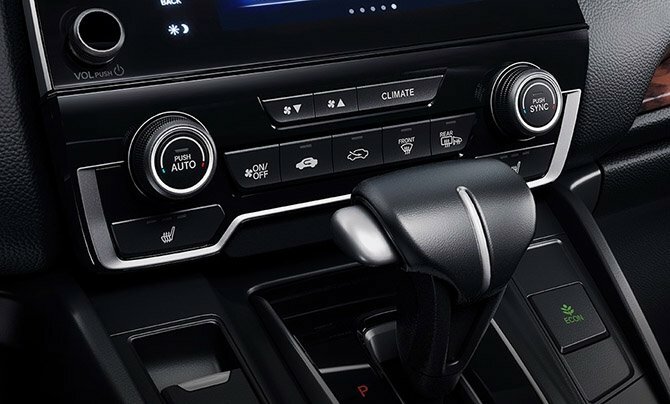 Dual-Zone Automatic Climate Control System – Finally, the CR-V’s dual-zone automatic climate control system allows passengers to heat or cool their climate zone to their personal comfort level. Experience the 2017 Honda CR-V Today! One more thing: You don’t have to take our word for all this. 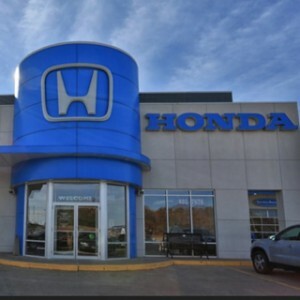 We want you to come by one of our Mid-Missouri Honda Dealers locations in order to take the new CR-V out on the road for yourself and experience all it has to offer in terms of interior features and comfort. Explore our financing options and be sure to read up on some little-known tips and tricks associated with CR-V. At the same time, don’t miss your chance to explore some of the current offers we currently have for you. Then, when you’re all ready, we invite you to contact us or to swing by one of our locations and experience the CR-V in person with a test drive!